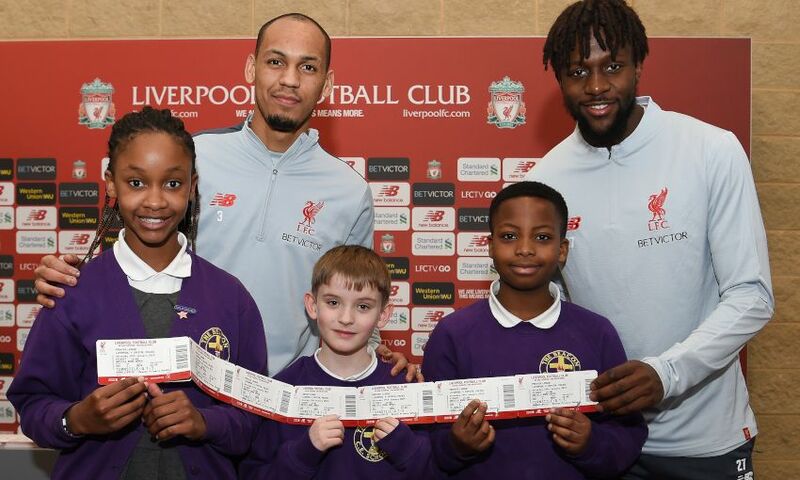 Liverpool stars Fabinho and Divock Origi this week presented pupils from schools in the local area with free match tickets for the Reds' game against Crystal Palace on Saturday. Children from Gwladys Street Primary School, St Francis de Sales Infants, St Margarets Anfield CE Primary School, The Beacon CE Primary School and The Trinity Catholic Primary School were invited into the first-team training ground at Melwood to meet the two players and receive the tickets. “I think this is a brilliant initiative, Anfield is a special place to watch football, so it’s great that we are able to give this opportunity to the kids,” said Origi. The free tickets for schools scheme, which gave more than 1,000 pupils the opportunity to attend matches at Anfield last season, provides local schools with 55 tickets for every Premier League home fixture. Twenty-one primary schools and four high schools in the L4, L5 and L6 postcodes will benefit from the initiative throughout the 2018-19 campaign as part of Red Neighbours’ focus on creating memorable experiences for young people.